When you consider that drumming legends Carmine and Vinny Appice have been part of the very fabric of the Rock and Metal establishment for just about as long as anyone still blessed with most of their own teeth can remember, it's nothing short of amazing that it's taken them more than forty years to record and release a studio album together. 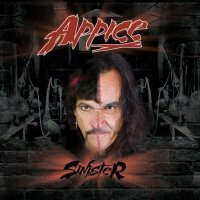 With a combined pedigree that covers everything from Vanilla Fudge and Black Sabbath to Dio and Blue Murder, the Appice name alone was always going to raise eyebrows, but when you factor illustrious alumni such as Craig Goldy, Joel Hoekstra, Tony Franklin, Paul Shortino and Chas West (to name but five) into the mix as well, anticipation levels go clean off the charts! With that thought in mind, what delights does the rather aptly titled 'Sinister' have to offer? Drumming duties are split pretty evenly, with the brothers sometimes doubling up, and sometimes letting the style most suited to the song or passage take the lead. Although the predominantly instrumental 'Drum Wars' has a real gladiatorial feel, with both Carmine and Vinny Appice each vying to outdo the other ï¿½ the split channel delivery also helps to accentuate the combatant feel. Featuring a mix of both new material and revisited classics from their long and remarkable careers, musically speaking 'Sinister' is predominantly old-school Hard Rock on the cusp of Metal, although the menacing title track which kicks things off has more of a post-modern frenetic Alter Bridge sort of sound to it. Carmine Appice also gets in on the act vocally with his surprisingly bluesy roar doing a tremendous job on 'You Got Me Running', whilst Shortino and Robin McAuley do themselves proud on 'Monsters And Heroes' (billed as a tribute to the late, great Ronnie James Dio) and 'Riot' (a gutsy re-imagining of the Blue Murder classic) respectively. Elsewhere, the likes of 'Killing Floor', 'Suddenly', 'Danger' and 'Future Past' all hit home with the precision of a laser-guided bomb, whilst album closer 'Sabbath Mash' is a bit of fun to throw a few shapes to. I was expecting a "slap on the back" drum-fest that was pretty much unlistenable to anyone but drummers, however, what 'Sinister' actually delivers is some truly great drumming within the context of a set of remarkably good songs ï¿½ very well done gentlemen!